Foreground: Bottlebrush buds. 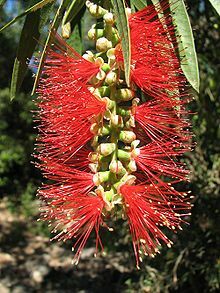 Background: Partial blooming bottlebrush flower. Blooming bottlebrush found in Kelantan, Malaysia. Bottlebrush flower partial blooming found in Kelantan, Malaysia. Tree in bloom in Florida.